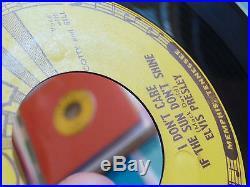 ELVIS PRESLEY, SCOTTY & BILL - I DON'T CARE IF THE SUN DON'T SHINE / GOOD ROCKIN' TONIGHT - 45 RPM SINGLE - SUN #210 - 1954. 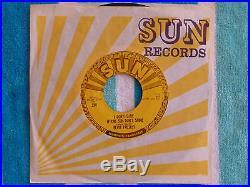 Original American 7 single release on Sun with yellow and brown labels. Original pressing of Elvis Presley's second single from 1954. Three push marks (see photo #3). Side 1: U-130-45 72 1122. Side 2: U-131-45 72 1123. Vinyl: VG/VG+ (a few visible superficial hairlines and sleeve marks--nothing deep or directly audible) Labels: VG+. Better than VG but not quite VG+. A record with obvious use but not abused. Visible light scratches, no skips, plays fine with some soft surface noise (clicks and pops). Cover may have a small split, a light visible ring, rounded corners or a few obvious creases, some writing on the cover. VG-/VG (VERY GOOD MINUS TO VERY GOOD)... Better than VG- but not quite VG. A fairly abused record that still plays without skips, a lot of surface noise and several imperfections. Better than G but not quite VG. Pretty much a filler copy, scratched to hell, may have skips, lots of background noise, maybe a little warped. Cover is damaged beyond belief. We are Kohl Kurios, two brothers: Jayson and Scott Kohl. Please check out our ever-growing store! Record buyers are encouraged to use the grading chart listed above. Any serious or unique flaws on a record will be mentioned next to the official grading. MEDIA ITEMS (records, books, cds, tapes, etc). FIRST CLASS if 8 oz. 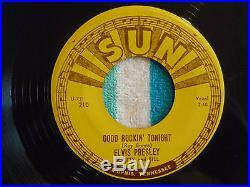 The item "ELVIS PRESLEY Good Rockin' Tonight 45 rpm SUN #210 1954 ORIGINAL 3 PUSH MARKS" is in sale since Friday, October 21, 2016. This item is in the category "Music\Records". The seller is "kohlkurios1" and is located in Eliot, Maine. This item can be shipped worldwide.